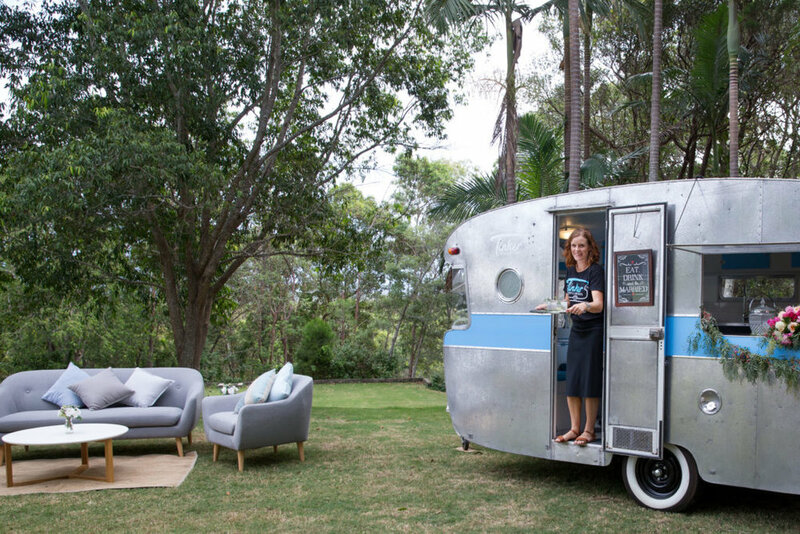 Vintage caravan bars are super in this year and Noosa is lucky to have a couple of its very own. Tinker Travelling Events offer a sweet retro vintage caravan, that is a fully refurbished mobile bar. It comes with - glassware, staff, ice and fridge. All you need to do is supply your drinks of choice (did someone say prosecco). I really like that you can come inside this retro caravan bar, making it not just a bar but a quirky space for you and your guests to enjoy the booth seating, take a couple of selfies and relax with an ice cold beverage...I am dreaming of an espresso martini. Tinker can also organise for you gourmet food platters and lawn games perfect for some pre dinner drink entertainment and nibbles for your guests. 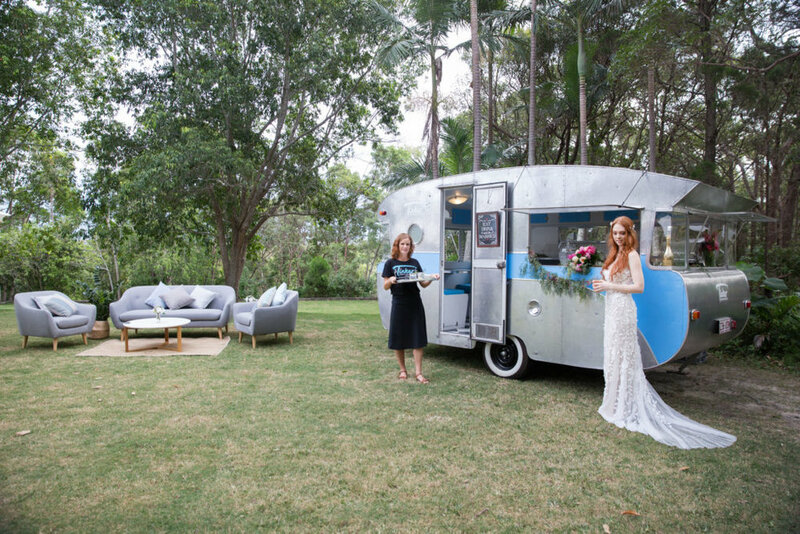 Tinker can be used on Noosa's many private property venues...be sure to keep an eye on our blog as we will be sharing Noosa's newest garden ceremony venue in a few weeks. While we are on the topic of Vintage lets talk about kombi's! Deluxe Kombi Services have two vintage kombi's the 1965 vintage red model which you will see below and the 1962 something blue model. These guys have also recently taken it to the next level with their brand new kombi photo booth #vwboxbrownie its pretty cool! 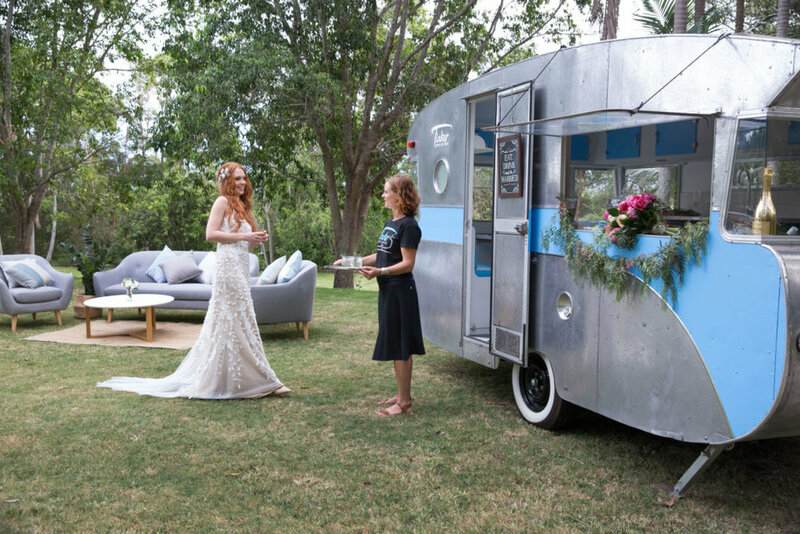 Here's a few reasons why you need a kombi for your wedding transport. 1. Kombi's are great for the larger wedding party as they can take 8 plus a driver, which makes getting around with your bridal party easy. 2. They look super awesome in photos. 3. They are cool! Now brides to be have you picked your wedding dress yet? for us bride's it is probably the most exciting part about the wedding.. well you know up until you marry your love of course. Saying "yes" to the dress is the first, I mean second reason we say "yes" to the proposal right? I invite you to check out Erin Clare's 2017 collection - featured below is "Aria" it is a delicate 3D embellished gown with sheer neckline, plunging back and silk button detail. It is divine and suited to beach or garden weddings. Her 2017 collection is to die for #sayyestothedress. Erin also does the most amazing veils, I was not sold on a veil for my wedding until I tried on one of Erin's it was the perfect accompaniment to my dress and scored me heaps of awesome floating in the breeze veil shots. 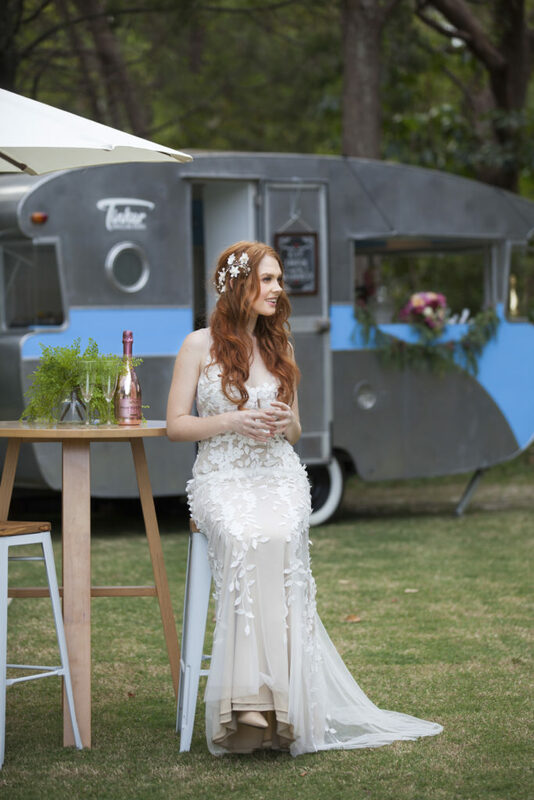 But if veils aren't your thing then check out the stunning headpieces designed by Noosa's Suzanne of Cherrywood Design.